The Pacific Northwest's never-ending rain decided to take a day off this past weekend, long enough for the Garage Where Cars Can't Park to have it's bulkier vintage acquisitions unloaded, organized and then reloaded into what is now unofficially known as The Garage Where Cars Still Can't Park. I felt a little sorry for all the people driving by who slowed down to check out the loot stacked up in my driveway, hoping for a yard sale. I would have done exactly the same thing. There's still no room for a car but we'll return to our regularly scheduled parking some time after Labor Day. Here's a few glimpses of what I've been bringing home in anticipation of selling at vintage events this summer. 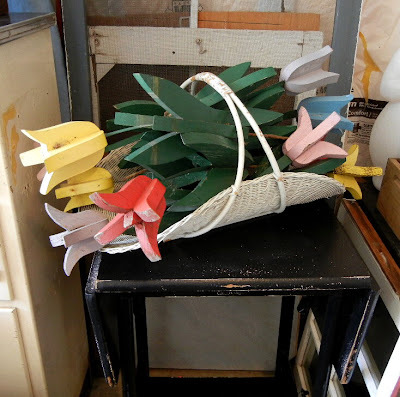 A fresh bouquet of wooden tulips. 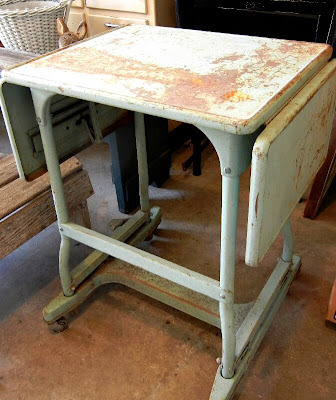 Rusty, crusty Typewriter Table #2 that the seller wrote the price on in black Sharpie marker. I think we all know how I feel about that. Chippy bistro chair. There are two of these. Found them this weekend with the Adirondack chair. 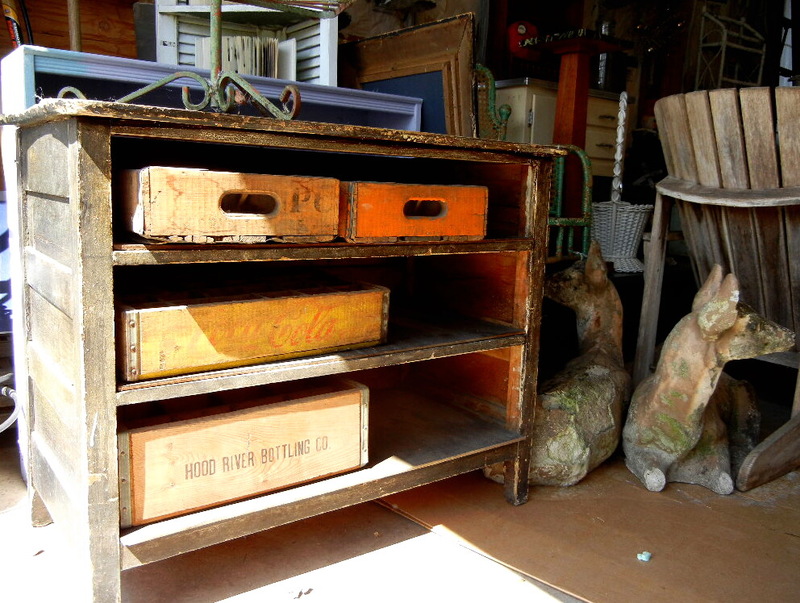 This might be the wild card -- a dresser without drawers. I pictured it being used as a potting table or something along those lines. Maybe you have some ideas? And the Sweeney Todd cabinet. The little wood shelf on top is a minor project even though I told myself "Self, no projects." 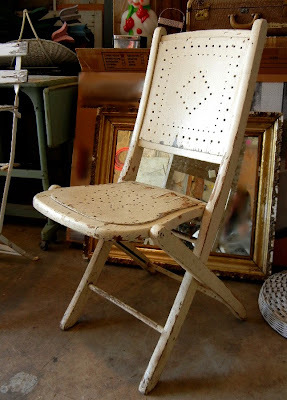 I've been reading so much about chalk paint on Miss Mustard Seed's blog that I have to give it a try. I wish I lived in this garage! 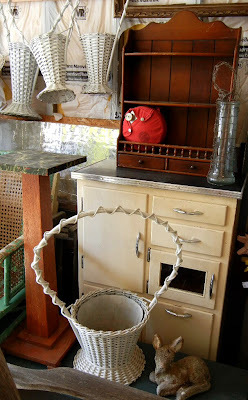 I agree with Kathy S. about the baskets; also you can hang some nice vintage fabric. Great storage! Wow, I'd like to find a garage sale with all that good stuff! I'm going to have a garage sale in May...wanna come?? Wow...I see a lot of great finds! Wish I was near you for your sales!!!!! Can I pre-shop your garage?????? Dang..what a lot of good stuff. 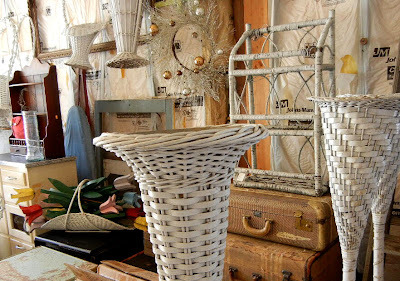 (the tall wicker pair - plant stands?) how do you find all these goodies????? great finds. i'm thinking potting shed thing, too. hilary (sweet june blog) bought some of that paint and is loving it. OY! Great stuff. That dresser without drawers would so be perfect as a kitchen island with storage for pans and dishes. And yes, wicker baskets for utensils would be awesome too. Thanks for letting us inside! Lots of great stuff! Wow great finds! You'll have a fabulous booth! 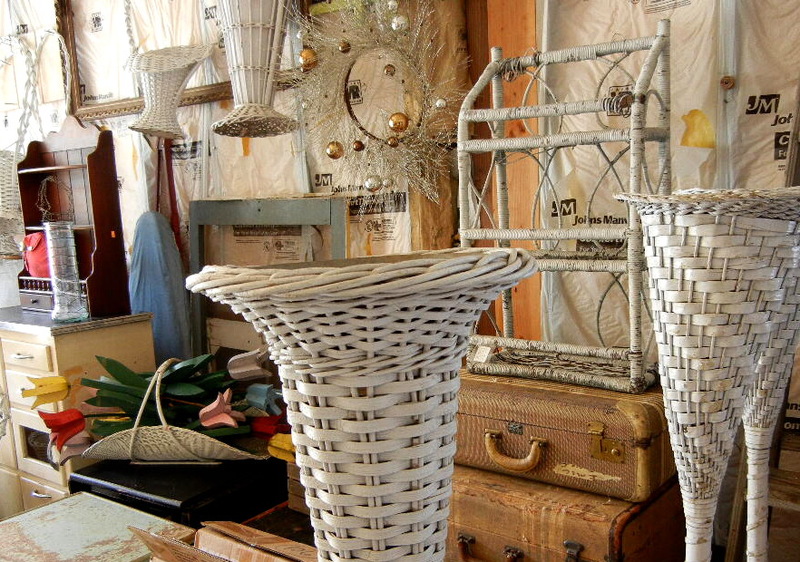 Those tall baskets want to go to a wedding. They are just the loveliest. The whole garage looks like paradise, if you ask me. Parking, shmarking. I have one of those garages.I recently put an aqua mid-century chair and two 8 panel windows in it.The car remains in the driveway where it may fall victim to the horrible spring storms.At least my junque will be safe! Great loot! If the marker was a Sharpie then rubbing alcohol will take it off. I have said it before and I'll say it again... the cars are USED to being outdoors and would probably just resent being locked up a garage anyway. Be free, cars! Be free! What sale are you doing this summer?? I'm with Gina....I'd LOVE to visit your garage Amy....And stay for a GOOD LONG WHILE....hahahahaha....! I reckon the drawless dresser would look GREAT as a cubby....All it needs is 3 or 4 inserts in each drawer space....How handy are you with a saw & hammer.... :o) ?? I have a garage and half a basement that look like that! I must say that getting the snow off the car when there is no room in the garage is worth the work though!!! Wow, that garage of yours looks pretty organized to me. I'd be so embarrassed to show you mine. I think that dresser with no drawers would be adorable with a little curtain. I did one for the Barn House sale last year and it looked great. Hope to see you soon! Oh boy, oh boy, oh boy!!! 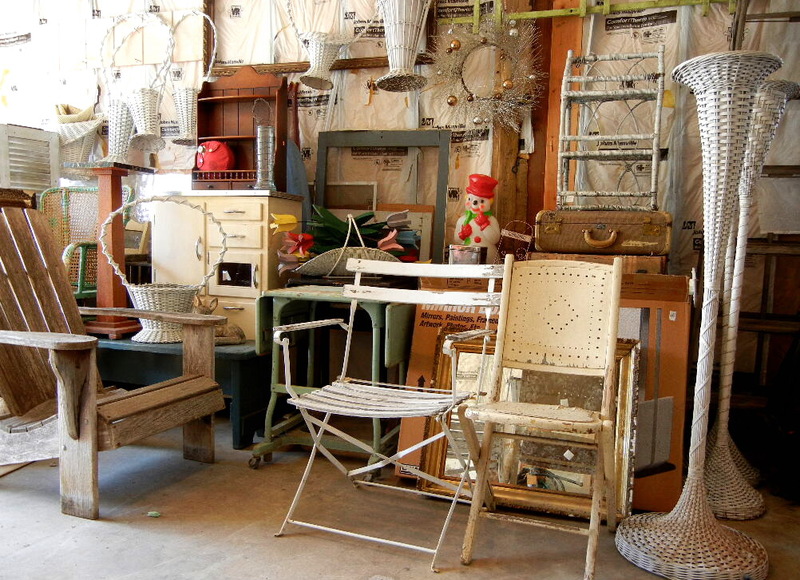 Your garage looks like it will fit in so nicely with A Vintage Gathering's sales. I am also excited about that chalk paint. Sounds easy and I like easy! If I lived nearby, I would have absconded with that Adirondack Chair by now. I would have lurked, out of view, until you left things unattended for just a minute - and then loaded it quickly into my car! Hahaha...it's like my garage all junking season long, too! We get many a looks thinking it's a garage sale=)...Love your finds & happy hunting! Wowza! I'd be slamming on my brakes to take a look at your stash too. Love all those chairs. The Sharpie thing should be a crime and come with a warning on the package. You're going to have some great sales this summer! I just love that you call your garage the Garage Where Cars Can't Park - it cracks me up every time! I love the piece with no drawers. I could totally picture it as a potting table or something with wire baskets / locker baskets. You have the most fun garage!! That dresser without draws would be wonderful in the kitchen as a place to store baking trays and platters. rrrrrrrrrrrrrrrrrrrrrrrrrrrrrr. That would be the sound of me purring with anticipation at your future sales at my house! Come to California, come to California, come to California. Come to central California, come to central California, come to central California. Come to my house. Come to my house. Come to my house. My eagle cat eye (yeah, whatever that is) spots even more treasures than what you highlighted. Did I spot something chippy and green???? you have me wanting to pack up the family and move across the planet! Why oh why do we not get this sort of vintage gold in Australia? I would be hard pressed to part with any of it, but the timber cafe chairs are my favorites. The empty dresser just wants wire baskets, does it not? WOW! you have so many nice things! Why didn't I comment on this? I read it eons ago, but I can't imagine I didn't have something profound to add via the comments. Anyway, I popped back over to tell you I finally caught up with all things Miss Mustard Seed, and I'm beyond obsessed with the chalk paint. Obsessed. Let me know if you give it a try. I'm kind of nervous to order without seeing the colors in person though. Plus, I don't really have anything in dire need of paint at this particular moment. But that's really irrelevant, isn't it? What great finds you have there. The more I see those baskets, the more I want one. Oh, I love those handled baskets! Can I buy one? Lots of great stuff! Hope you do well at your sale! my garage is messy and there is nothing cute in it at all....just a bunch of stuff like tools, bikes, christmas stuff, more tools and stacks and stacks of army stuff. right...the ole sharpie marker price. i do remember you posting about the way thrift shops price the merchandise with markers and grease pens. it is a pet peeve for me too. i love that green table and those chairs are all super fun. good luck with it all and hope the rain goes away. Great finds you have there! 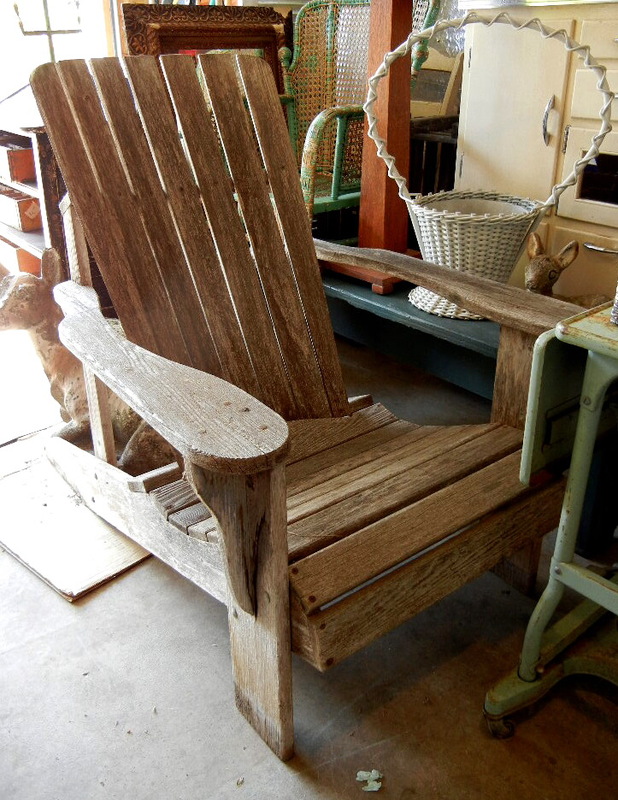 I love the Adirondack chair - beautifully rustic! Just stumbled upon your blog and it's lovely over here. Will be back. Thanks for sharing all of your wonderful vintage finds; I especially love the old brown suitcases resting upon the table. Hi I'm visiting from your other website Vintage Guide by way of CA and I love your blog. I also wanted to ad a link for my new marketplace coming this June. I was unable to email you.